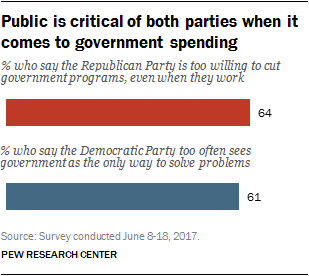 The public continues to be critical of both political parties. Both parties’ favorability ratings are more negative than positive and fewer than half say either party has high ethical standards. Majorities also fault both for their approach to government spending. The latest national survey by Pew Research Center, conducted June 8-18 among 2,504 adults, finds that despite the tumult in Washington, overall impressions of the two parties – and President Trump – have changed very little since April. Currently, 39% approve of the way Trump is handling his job as president, while 55% disapprove. For more, see detailed demographic tables on Trump’s job approval. 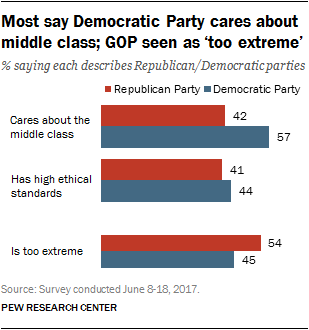 While large majorities in both parties characterize the other party as too extreme, Republicans are more likely than Democrats to describe their party this way (24% of Republicans, 18% of Democrats). Perceptions of both parties remain little changed from April. Currently, four-in-ten have a favorable view of the Republican Party, while 54% express an unfavorable one. A comparable share of the public rates the Democratic Party favorably (44%), while half have an unfavorable opinion. Ratings for both parties are lower than they were in January, when about half viewed the Democratic (51%) and Republican (47%) parties favorably. 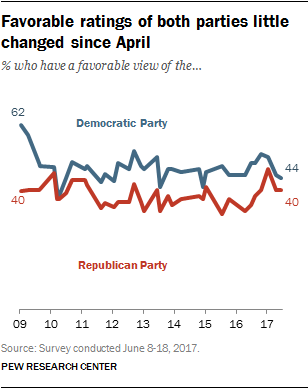 Nearly eight-in-ten Republicans and leaners (77%) have a favorable view of the GOP, little changed since the beginning of the year. Democrats view the GOP less favorably now (12%) than in January (23%). Fully three-quarters of Democrats (75%) rate their party positively today, up slightly from April (70%). Republicans view the Democratic Party less favorably today (11%) than they did in January (23%). Donald Trump’s job approval continues to remain more negative than positive. Currently, 39% of the public approves of the way Trump is handling his job as president, while 55% disapprove. Ratings of Trump are virtually unchanged from April (39% approved) and February (also 39%). As has been the case throughout the early stages of Trump’s presidency, these views are starkly divided by gender, race and ethnicity, age and education. Support for Trump is highest among whites, men and older adults. Half of whites approve of the job Trump is doing as president, and 44% disapprove – the only major demographic group in which more approve than disapprove. Large majorities of blacks (88%) and Hispanics (72%) give Trump negative job ratings. Among men, nearly half (49%) disapprove of Trump’s job performance, while 44% approve. Women disapprove by a much wider margin (60% to 34%). Adults 50 and older are divided in their views of Trump: 46% approve, 49% disapprove. Among those under 50, 32% approve, while nearly twice as many (60%) disapprove. There continues to be an educational divide in views of Trump. Two-thirds of Americans with a college degree or more education (66%) – including three-quarters of those with a postgraduate degree – disapprove of Trump as president. Trump’s job rating is more divided among those with less education. Among adults without a four-year degree, 42% approve of the job Trump is doing and 50% disapprove.